Hapkido is a Korean martial art which emerged in the mid-twentieth century and quickly grew to become an international style. Its founders created the art by selectively fusing a wide range of existing martial skills, with new innovations. The basis for much of Hapkido’s technical material is thought to come from Daito Ryu Aiki-Jujutsu, a Japanese art, which was reinterpreted and integrated with a broad range of native Korean philosophical ideas and martial techniques. Hapkido’s founders also created many unique martial techniques, some of which have since been adopted by other martial arts. 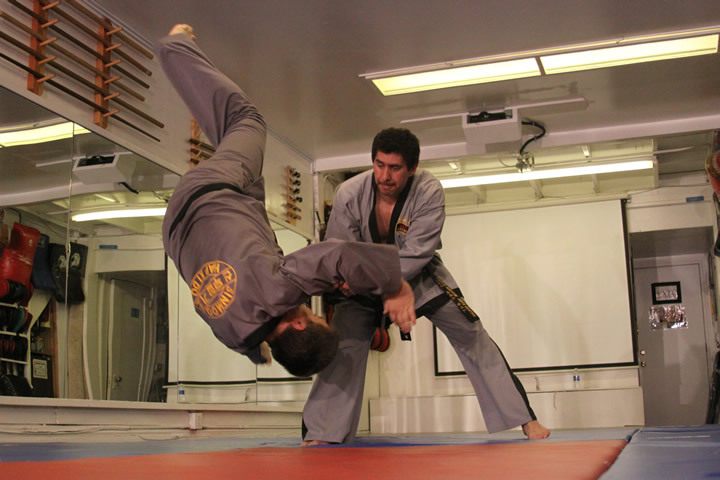 As a result, Hapkido possesses one of the most complex, unique, and varied arsenals of self-defense techniques to be found in any martial art. 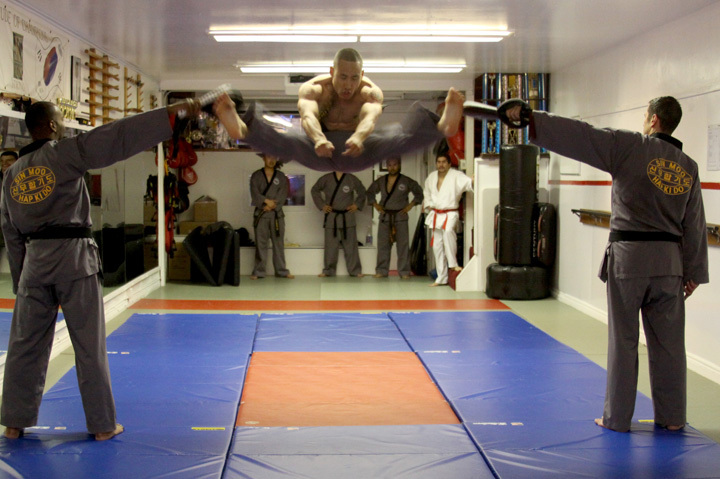 These techniques encompass all major martial categories including: strikes, kicks, blocks, avoiding movements, holds, joint locks, chokes, throws, breakfalls, tumbling, ground fighting, weapons, meditation, and healing. Like many Asian martial arts, Hapkido emphasizes the unification of body, mind, and spirit; the perfection of human character; social responsibility; and appropriate use of force. 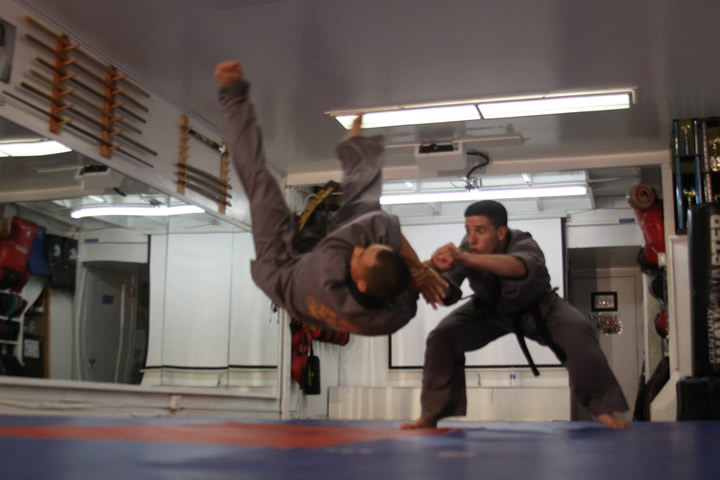 Unlike most martial arts, Hapkido utilizes more than 1100 core techniques, which are intuitively modified or combined to create thousands of variations. Self-defense techniques are characterized by a constant flow of striking, blocking, holding, and throwing techniques. Constant motion and fluid circular movements are designed to blend with an opponent’s force. Tactics often alternate between highly aggressive and defensive modes, with power being generated through use of one’s entire body. Internal energy development is fundamental to all training, leading to increased health and greater efficiency in self-defense techniques. Hapkido techniques are not only for self-defense. Meditation and healing techniques are used to develop emotional stability, peace of mind, and confidence, while providing the same health benefits found in other arts, such as Tai Chi Chuan and Qi-Gong. Thus, Hapkido is a highly practical self-defense art with strong spiritual underpinnings. 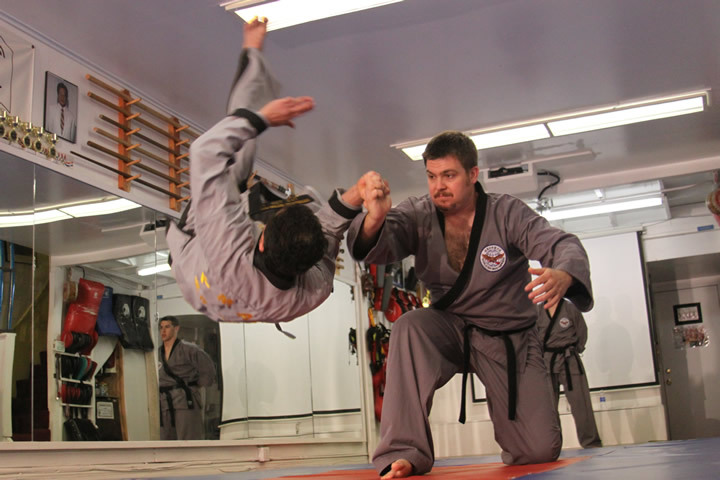 In contemporary society, Hapkido is mostly practiced for self-defense, health, and spiritual growth. 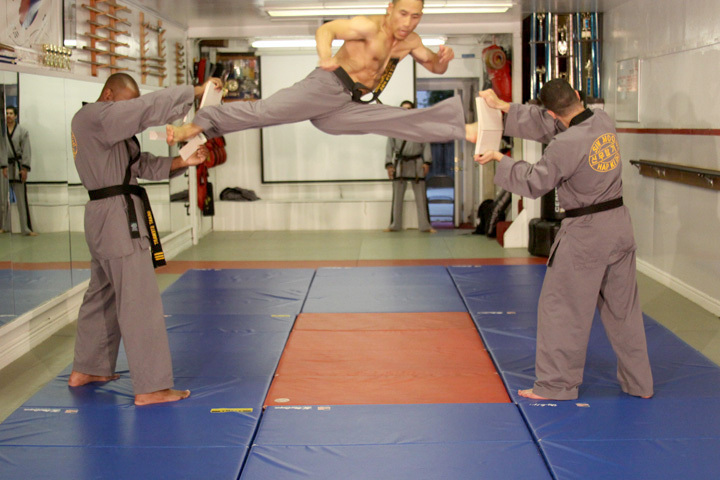 Although it is often compared to Aikido, Taekwondo, Jujutsu, Judo, and Tai Chi Chuan, it has a much broader range of techniques, suitable in a wider range of situations. This has made it adaptable to a wide range of body physiques, personalities, and lifestyles. Hapkido is currently practiced by a diverse range of men, women, and children of all ages; working professionals; gifted athletes; the physically impaired; those simply seeking physical exercise; as well as military and law enforcement professionals. 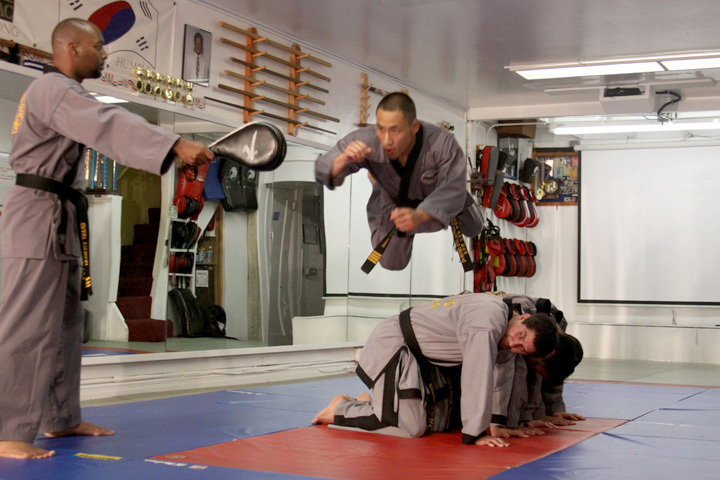 Hapkido is currently practiced in more than 100 countries and continues to expand rapidly. Hapkido: Traditions, Philosophy, Technique by Marc Tedeschi. Previous text copyright 2000 by Marc Tedeschi and is reproduced by permission. All rights reserved. Unauthorized reproduction is prohibited. decorted with unique 10th dan medal, special honorary sash, gold belt and elevated to highest level dan certificate. Joined with GM Juerg Ziegler and GM Kenneth McKenzie at the 2010 World Master’s Conference with equivalent awards. Asan, South Korea – Hapkido Founder DoJuNim Ji, Han Jae recently held his Handing Down The Techniques International Sin-Moo Hapkido Seminar & World Hapkido Master’s Conference at the Sun-Moon University in Asan, South Korea. The highlight of the event was the promotion of the three international grandmasters to the level of tenth-degree black belt. DoJuNim Ji, Han Jae, having announced his retirement, has appointed Grandmasters Kenneth P. MacKenzie (USA), Jurg Ziegler (Switzerland) and Merrill Jung (Hong Kong / USA) as the three chosen “Supreme Grandmasters” to carry the torch forward. Several additional eighth and ninth-dan promotions were also administered at the event, which was well-attended by the leading Hapkido representatives from 14 nations.